We have been hard at work with our clients this summer, from expanding their brand awareness to expanding their team. Our clients have received recognition from the media, upgraded their marketing strategies, and added new faces to their companies this summer. Here’s an overview on what’s happened so far. Our clients are industry leaders and have been featured in media outlets ranging from trade publications to local television stations. Dune Medical recently published a surgeon spotlight on Dr. Jennifer Simmons, a breast surgeon in Pennsylvania, that was picked up by FOX 29. 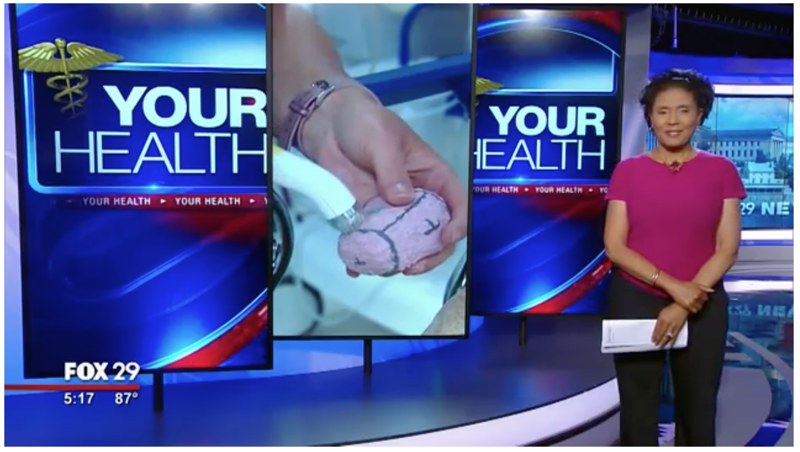 Joyce Evans, a FOX 29 reporter, conducted an interview with Dr. Simmons on her experience as a breast cancer surgeon and her experience with Dune Medical’s MarginProbe device. The interview discussed the benefits that MarginProbe can provide for the surgeon and the patient and the positive effect that the device has had on Dr. Simmons’ re-excision rates. You can view the FOX 29 interview with Dr. Simmons here. SmartCommerce and their CEO, Jennnifer Silverberg, are taking the retail world by storm with their expertise in the online customer buying experience. Jennifer was recently named one of the top women changing the retail world by Retail Leader, being recognized alongside women leaders from companies like Walmart, Kohls, Starbucks, and more! Jennifer is also looking forward to speaking at the Path to Purchase Expo this fall for the second year in a row. Kim Withrow, General Counsel for Bibby Financial Services (BFS), was profiled in the June issue of The Secured Lender for her commercial lending expertise. The feature highlighted her previous experience in the commercial lending industry, her responsibilities in her current position at BFS, and the advice that she would offer to any women joining the finance industry that is largely dominated by men. We’ll be writing a win blog and spreading the word! This past month we posted a blog on how to use a podcast as a new marketing tool for your business, and the inspiration for that post came from our client, John Maxwell Company. We have been working with them since April to produce their first podcast, and our next recording session is scheduled for this month. We have eight episodes live so far and you can check them out here! ASP Global is also undergoing a marketing change, including a complete rebranding of their company. W2M has been helping them update their website and they recently launched ASPMedical.com, the official rebranding of Tiger Medical. Stay tuned for news and updates on more rebranding from ASP. Acensium has expanded their leadership team by welcoming Cale Collier as the new VP of Scan & Model Services. With Acensium’s business growth increasing their demand, Cale’s main responsibilities will be running the division and expanding the scan and model team to capture the majority market share of industrial scan and model services. We’re excited to collaborate with Cale on future projects for Acensium this summer! And last but not least, we’ve added a new face to our team as well! This past May, we welcomed Victoria Jackson as our new Junior Account Executive. She just graduated from Auburn University with a major in Communication and a minor in Marketing. She was raised in sunny South Florida, but grew up an Atlanta Falcons fan and is excited to finally be close enough to attend some football games this fall. She previously interned for Coca-Cola Studios while still in college and some of her hobbies include reading, listening to podcasts, and video editing. Welcome to the team, Victoria. We’re so excited to have you! Don’t let your PR and marketing take a summer holiday. Contact us to see how we can help!